Dry eye occurs when the eye does not produce tears properly, or when the tears are not of the correct consistency and evaporate too quickly. In addition, inflammation of the surface of the eye may occur along with dry eye. If left untreated, this condition can lead to pain, ulcers, or scars on the cornea, and some loss of vision. However, permanent loss of vision from dry eye is uncommon. Dry eye can make it more difficult to perform some activities, such as using a computer or reading for an extended period of time, and it can decrease tolerance for dry environments, such as the air inside an aeroplane. Other names for dry eye include dry eye syndrome, keratoconjunctivitis sicca (KCS), dysfunctional tear syndrome, lacrimal keratoconjunctivitis, evaporative tear deficiency, aqueous tear deficiency, and LASIK-induced neurotrophic epitheliopathy (LNE). Stinging or burning of the eye. A sandy or gritty feeling as if something is in the eye. A stringy discharge from the eye. Pain and redness of the eye. Inability to cry when emotionally stressed. Medications: These include antihistamines, nasal decongestants, tranquillizers, certain blood pressure medicines, Parkinson's medications, birth control pills and anti-depressants. Skin disease on or around the eyelids can result in the dry eye such as Acne Rosacea. Meibomian gland dysfunction can cause dry eye. Pregnancy: Dry eye can occur in women who are pregnant. Hormone replacement therapy: Women taking only estrogen are 70% more likely to experience dry eye, whereas those taking estrogen and progesterone have a 30% increased risk of developing dry eye. Post-LASIK surgery: These symptoms generally last 3-6 months but may last longer in some cases. Chemical and thermal burns that scar the membrane lining the eyelids and covering the eye. Infrequent blinking, associated with staring at a computer or video screens. Vitamin deficiency or excess: The extremes of vitamin dosages can contribute to dry eye. Homoeopathic remedies may have an adverse impact on a dry eye condition. 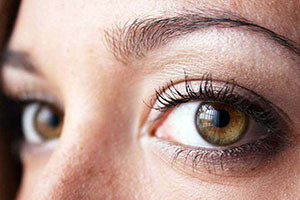 Contact lenses: Loss of corneal sensation from long-term contact lens wear can lead to dry eye. Immune system disorders such as Sjögren’s syndrome, lupus, and rheumatoid arthritis. Sjögren’s leads to inflammation and dryness of the mouth, eyes, and other mucous membranes. 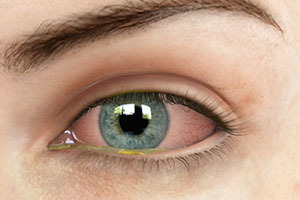 Conjunctivitis: Chronic conjunctivitis can be caused by certain eye diseases, infection, exposure to irritants such as chemical fumes and tobacco smoke, or drafts from air conditioning or heating. Thyroid eye disease: Dry eyes can result from the thyroid disorder causing the eyes to protrude excessively from the eye sockets. This results in the inability of the eyelids to close properly over the eyeballs and drying occur due to exposure. Elderly people frequently experience dryness of the eyes, but dry eye can occur at any age. Dry eye is more common after menopause. Women who experience menopause prematurely are more likely to have eye surface damage from dry eye. Depending on the causes of dry eye, your doctor may use various approaches to relieve the symptoms. 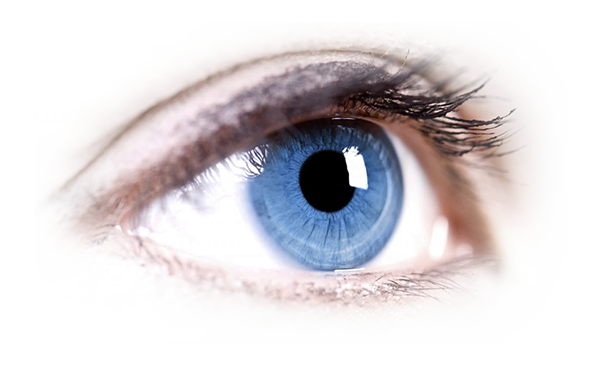 Dry eye syndrome can be managed as an ongoing condition. The first priority is to determine if a disease is the underlying cause of the dry eye (such as Sjögren’s syndrome or lacrimal and meibomian gland dysfunction). If it is, then the underlying disease needs to be treated. If the contact lens wear is the problem, the doctor may recommend another type of lens or reduce the number of hours you wear your lenses. In the case of severe dry eye, your eye care professional may advise you not to wear contact lenses at all. An anti-inflammatory medication, decreases corneal damage, increases basic tear production, and reduces symptoms of dry eye. It may take three to six months of twice-a-day dosages for the medication to work. 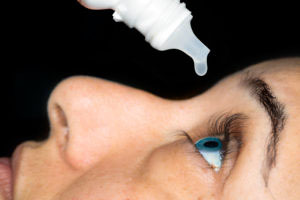 In some cases of severe dry eye, short-term use of corticosteroid eye drops that decrease inflammation is required. If dry eye results from taking a medication, your doctor may recommend switching to a medication that does not cause the dry eye side effect. Another option is to plug the drainage holes, small circular openings at the inner corners of the eyelids where tears drain from the eye into the nose. Also called punctal plugs, can be inserted painlessly by an eye care professional. The patient usually does not feel them. These plugs are made of silicone or collagen, are reversible, and are a temporary measure. In severe cases, permanent plugs may be considered. Use artificial tears, gels, gel inserts, and ointments which are available over the counter as the first line of therapy. They offer temporary relief and provide an important replacement of naturally produced tears in patients with aqueous tear deficiency. Avoid artificial tears with preservatives if you need to apply them more than four times a day or preparations with chemicals that cause blood vessels to constrict. Wearing glasses or sunglasses that fit close to the face (wraparound shades) or that have side shields can help slow tear evaporation from the eye surfaces. When indoors, an air cleaner (to filter dust particles) and a humidifier (to add moisture to the eye) may help prevent dry eyes. Avoid dry conditions and allow your eyes to rest when performing activities that require you to use your eyes for long periods of time. Instil lubricating eye drops while performing these tasks.